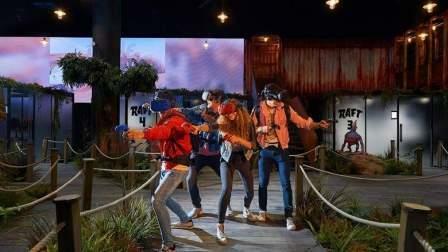 A new entertainment complex that combines augmented reality and virtual reality (VR) has opened at The Dubai Mall. "The park will send visitors into unforgettable rides, journeys and games," according to Emaar Entertainment. The 7,000-square metre park is located on level 2 of the mall. Some of the VR games that blur the lines between perception and reality at the park include the Burj Drop, where one will feel like propelling down the side of Burj Khalifa. There is also Dubai Drone taxi that spins out of control on a roller-coaster adventure. In Plummet, one will have a skydiving experience while Dune Bash will give someone a close encounter with camel spiders, scorpions, snakes and other thrilling creatures. Allowing visitors to interact with one another and live the experience together, The Raft requires players to grab their VR guns and work together to defend the swamp against an infestation of supernatural creeps; while gamers will love Payday 2 VR heist, and the challenge to survive a zombie-infested hospital in the apocalyptic The Walking Dead Outbreak.